If you've ever grown bananas then you've come to realize pretty quickly they are going to multiply... sometimes quite rapidly. No, bananas are not related to bamboo, but sometimes you might think it. This blog entry it meant to quickly show you just how easy it is to split bananas from one another and away from the "mother corm." First, you need to select the right tool; and it's not your shovel. Your shovel is too wide to get into the narrow space you're probably digging in and will likely do more damage than not. It also cannot give you the proper leverage you'll need. The best tool we've found and that has been hailed by others as, "perfect for the job," is the digging bar. You can pick one up at your local hardware store for $10-$20 tops. You're looking for a bar that has a broad flat tip, not a sharp one; see the photo on the right. Once you've got the right tool, you simply need to educate yourself on what's going on beneath the surface. The illustration shown here is what a typical banana mat looks like above and below ground (click to enlarge). On the next few pages we'll go over exactly how to severe the pup from the main banana plant (mother corm). Before you start chopping away, let's go over what size pups you can actually remove from the mother plant. If it's under a foot tall, forget about it - the corm hasn't had time to adequately develop. If you split one off this size, you're only real chance at getting it to survive is to put it in water until it can develop (if it does at all). Sometime when digging up a banana or splitting a larger pup, you'll discover these smaller pups by accident, so it's worth knowing you can *try* and save them. But as a general rule, don't try and split pups under 1ft tall. There are also two types of pups you should know about, water suckers and sword suckers. The photo here shows the difference. 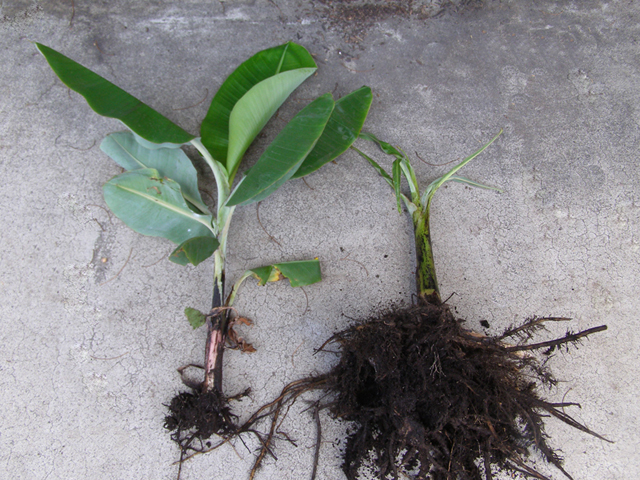 The sword sucker on the right has a tremendous amount of root structure compared to the water sucker on the left. Guess which one will grow faster once split from the parent plant? Right... the sword sucker. All those roots mean good and fast growth. The water sucker doesn't have much of a corm, and will be slow to grow - and in some cases, it might die off entirely. Water suckers are often very dependent on the mother corm for their well being. Sword suckers already have developed their own corm, and are better suited for growth away from the mother corm. But on that note, ALL bananas will grow faster when still attached to the mother corm. Once you split a pup, it's going to grow slower than it would if it were still attached. Rest assured though that once it recovers from the shock of being moved/separated, it'll grow vigorously again. Knowing what you do now, the key is to go in at the right angle with your digging bar. 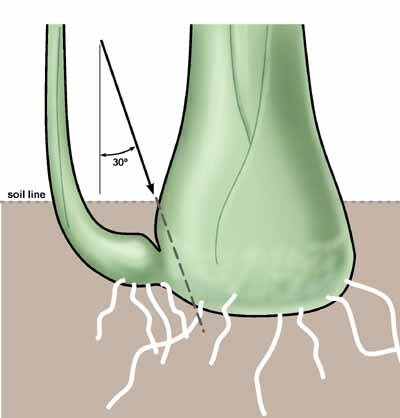 If you go in at to shallow an angle you might not get enough of the corm, or too obtuse and you might get too much and damage the mother corm in the process. This isn't exact science, but the illustration here is a good guide to follow. Click the image to enlarge it. 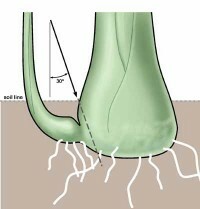 Once you severe the connection, the pup should pull right out of the ground - try and keep as many roots as you can without digging up too much around the banana. The roots are pretty strong and will hold as you pull out the pup. If you're in clay, just us extra caution pulling the pup out since clay is more likely to hold onto the roots. The pup is going to wilt a good bit after you re-pot it or place it back in the ground. You can help the process by trimming off the leaves (except the newest one at the top), or you can just water it heavily until it perks back up. Chances are most of the leaves are going to wither off though and you'll have to remove them anyway. After you split a pup, its main focus is going to be with rebuilding the roots. If you're splitting the pup off after September in zones 7-9, use caution before putting it back in the ground - especially if it's a small pup. It may not have time to adequately grow new roots for the winter ahead. If you're in a northern zone, you may want to pot your pup up anytime after mid-July and wait and put it in the garden the following year. We hope this short blog entry has been useful. If you have any questions, please let us know in the comments section below. Or start a new thread on our forum. I am read to the splitting banana pups.Bananas,ice cream,hot fudge,nuts,and a cherry and you would be good. I want to transplant the pups but I'm afraid I'll hurt the mother plant.I really love this plant and do everything I can to make it grow.It is in a large pot.Right now it is outside for the summer but will be in when it gets cold. I was so excited to see that my mother plant sprang up 3 new pups! I just transplanted them all tonight, I had one sword sucker and 2 water suckers. I know that the two water suckers may die, but I put them together in the same pot and watered them heavily. I put the sword sucker in it's own pot and the mother plant in a new, larger pot. All were watered heavily and now all I can do is hope for the best! This blog helped out more than ever! Wish my puppies luck! Thanks so much!